Comptoir des Cotonniers said today it would open 10,000 stores overnight — virtually, that is. The French contemporary brand has launched Fast Shopping, a new retail experience that allows European customers to make a purchase in 20 seconds using their mobile phone, thanks to an application developed by London-based firm Powa Technologies. A one-click payment dispatches the goods, which are delivered within 48 hours. “In effect, all these supports can turn into stores and, by winking at customers, trigger an impulse-buying urge, giving her an experience that — thanks to the application — is totally new,” said Valérie Dassier, head of e-commerce, customer relationship management and customer service at Comptoir des Cotonniers. “There has never been a faster shopping experience,” she added. The service launches today at the Publicis Drugstore on the Avenue des Champs-Élysées, which will feature the message on café tables and outdoor advertising, effectively giving Comptoir des Cotonniers a virtual flagship on one of the world’s most famous thoroughfares, Dassier noted. Fast Shopping will be featured on a total of 10,000 supports ranging from bus shelters owned by outdoor advertising giant JCDecaux to advertisements in magazines like Grazia and Elle. In addition to providing a practical service for busy women, it will allow marketers to measure the quality of their investments, Dassier said. The concept is supported by a report from Forrester Research estimating that mobile spending in Germany, the U.K., France, Spain, Italy, the Netherlands and Sweden will rise to 19.2 billion euros, or $26.2 billion at current exchange, by 2017. The term Fast Shopping is a nod to Fast Retailing Co. Ltd. — owner of Comptoir des Cotonniers in addition to brands including Uniqlo, Theory and Princesse Tam Tam — but Dassier hopes it will enter the vernacular. “Once we have gone through a phase in which the different brands within the group will hopefully roll out this model, we would not be against other brands adopting this approach and turning it into a bona fide shopping experience on par with ‘click and collect’ or other terms that have now entered the collective consciousness,” she said. Comptoir des Cotonniers is offering around 30 stockkeeping units priced from 55 euros to 345 euros, or $75 to $470. These include a clutch from its capsule collection with Mercado Global, handcrafted in Guatemala. A second wave of products is to be released in November in the run-up to the holidays, and the brand is also working on a “click and collect” service. The PowaTag application is certified Level 1 Payment Card Industry Data Security Standard compliant, ensuring transactions are safe. 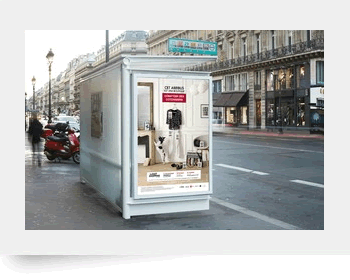 In addition to Powa Technologies, Comptoir des Cotonniers has partnered on the project with JCDecaux, mobile phone operator SFR, Uber and Paris-based creative agency Marcel Worldwide. E-commerce accounts for around 10 percent of the brand’s sales in Europe, the only region to offer online shopping apart from Japan. Mobile sales represent between 40 and 50 percent of this total, said Dassier. Comptoir des Cotonniers, which has fewer than 400 points of sale worldwide, would eventually like to see online sales contributing around 20 percent of its turnover, she added.